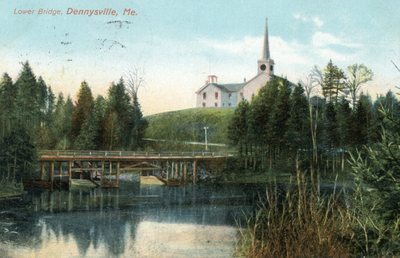 "Dennysville, Maine, Lower Bridge and Congregational Church "
An image scanned from a color postcard depicting the lower bridge in Dennysville, Maine. Undated. In the background stands the Dennysville-Edmunds Congregational Church, which was erected in 1834 on King Street in Dennysville.